We highly value your trust and appreciate your loyalty. 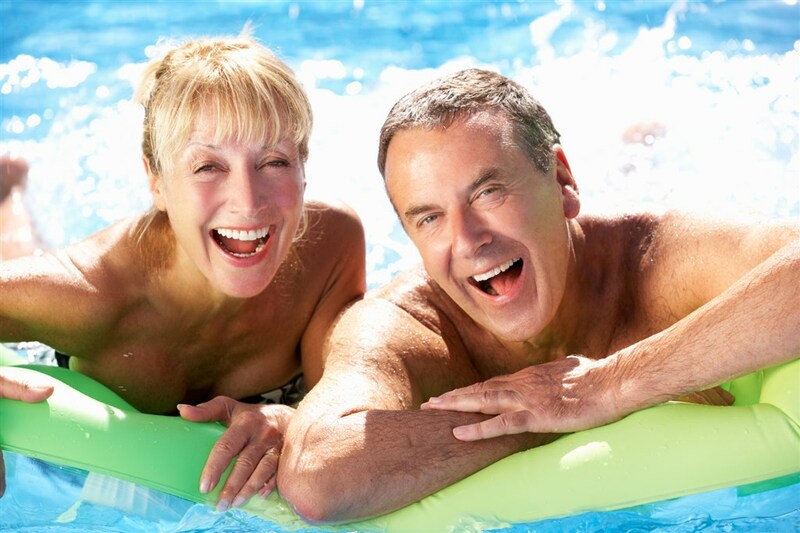 For this reason , we have prepared a loyalty program for you – the Radon Spa Club. To its members, the club offers a number of benefits, which they may acquire immediately after registering for membership. 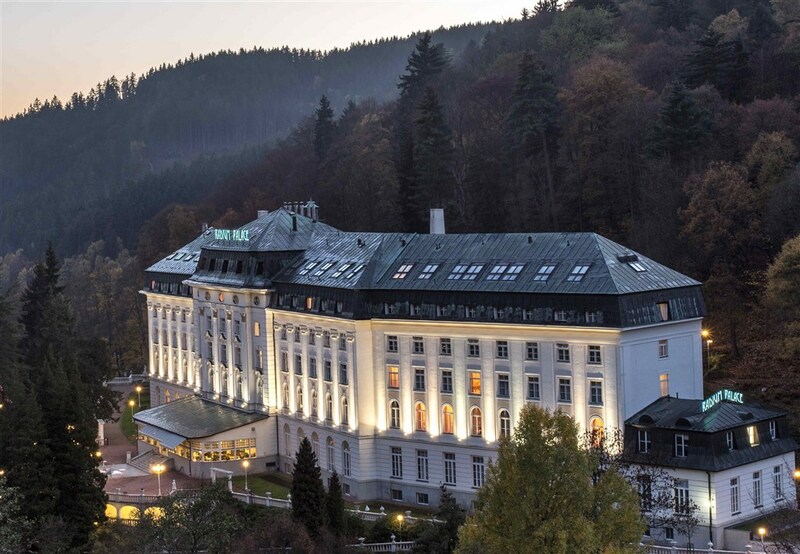 Every time you stay at Léčebné lázně Jáchymov a.s. (hereafter the "Spa") you will be rewarded with loyalty points, which will be added to your bonus account after you pay your hotel bill at the end of your stay. All Spa services are assigned specific points that are entered in the spa reservation system. For every CZK 1,000 spent, the system generates 0.8 to 1 point depending on the type of services. You may check the actual balance of your bonus account at the hotel reception. You can either exchange the points for a higher membership level to gain more benefits, or you may exchange them for selected services at our bonus shop. If you have made a fixed reservation of your stay or you are already a guest at one of the Spa hotels, you are eligible to free club membership. You may start collecting loyalty points and take advantage of all offered benefits. 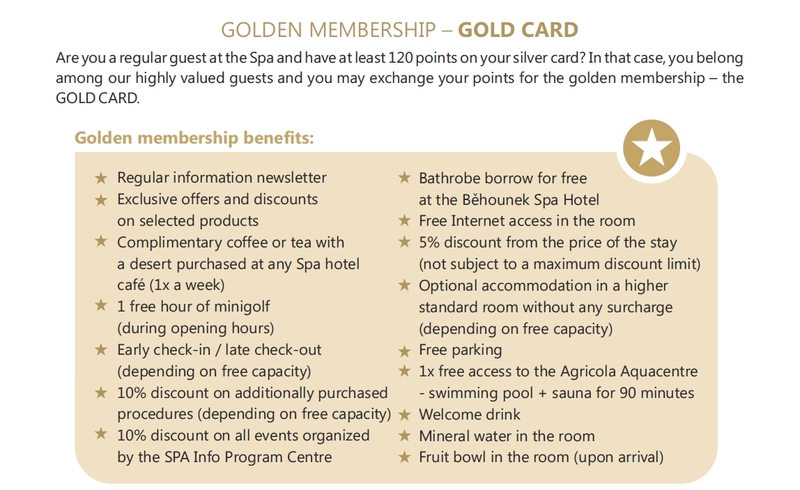 Are you a frequent guest at the Spa and have at least 120 points on your card? 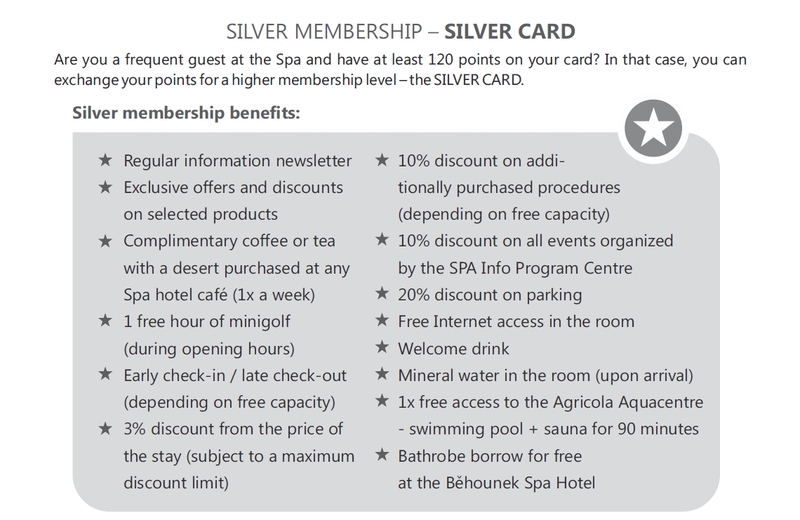 In that case, you can exchange your points for a higher membership level – the SILVER CARD – and obtain the following benefits. If you have a sufficient number of points and want to upgrade your membership to a higher level, simply complete a new registration form. Specify what type of membership you apply for and hand in the completed form at the hotel reception. PIf you do not want to save your points to advance to a higher membership level, we offer you the opportunity of exchanging them at our bonus shop. You may now select from a wide offer of services. A list currently available services may be found on our information boards or HERE. Order the selected services and have them charged to your hotel bill. Because the club card is non-transferable, services may be charged only to your own hotel bill. However, club members may choose to have certain items from the hotel bill of another guest, as selected by the them, charged to their hotel bill. Prior to settling your hotel bill, kindly advise the reception staff that you will use your bonus points to pay for selected services. Simply hand in the completed registration form at any Spa hotel reception. 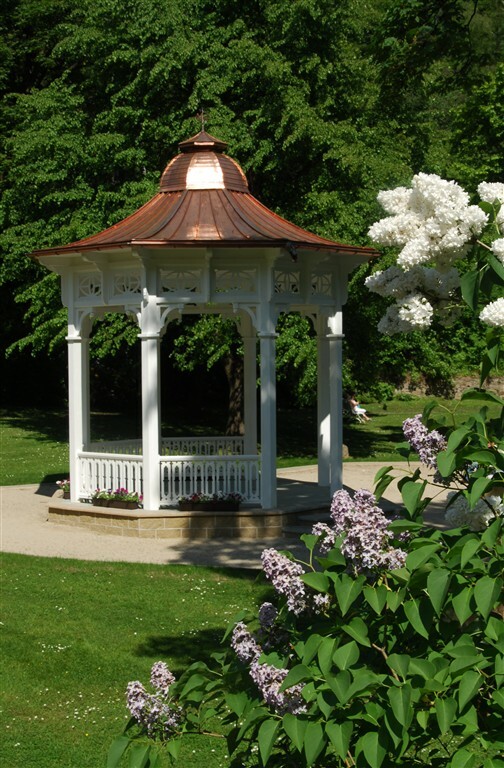 Registration forms are available at our hotel receptions, on information boards or on website HERE. Club membership commences on the date on which a valid registration form is accepted by the Spa. All new club members receive a club membership card upon effecting their reserved stay at the Spa. 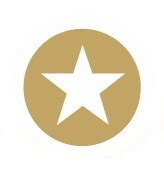 The card serves for quick identification of the member in connection with different club matters, e.g. with club partners. The cards correspond to the specific membership level. 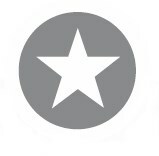 Silver and gold card may be collected by the member in person at the reception at any time from the moment they check-in for their subsequent stay after submitting their registration form. WHERE CAN I OBTAIN ADDITIONAL INFORMATION ABOUT THE CLUB? Complete information is provided in the Radon Spa Club General Rules that are available at all hotel receptions or on our website HERE. 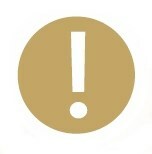 The cards «Sphere» have a limited period of validity, which is indicated on them. The period of validity only applies to the use of the SPHERE loyalty program. It does not apply to the club membership. You may continue to collect points on your Sphere card and take advantage of the discounts offered by Spa and the partners of the loyalty program. Discounts are added up to a maximum limit, which is officially presented in the current price list or on the Spa website. Léčebné lázně Jáchymov a.s. reserves the right to modify the terms and conditions for the issue of membership cards and the associated benefits. 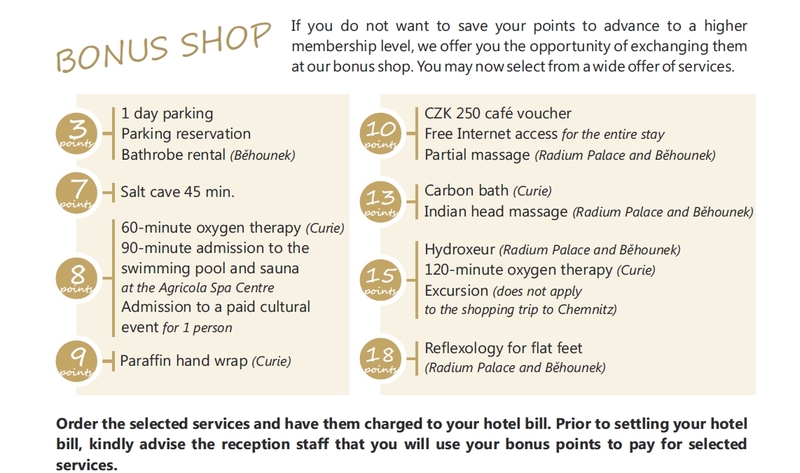 We believe that you will be satisfied with the benefits offered by the Léčebné lázně Jáchymov loyalty program.